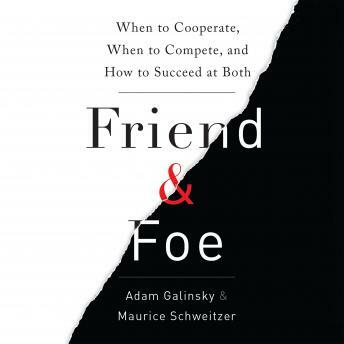 Galinsky and Schweitzer draw on original, cutting edge research across the social sciences to show how to to maximize success in work and in life by deftly navigating between cooperation and competition. They offer insights into topics ranging from how to get and keep power, how to recognize deception and build trust, how to turn our weaknesses into strengths, and when to begin a negotiation to get the best outcome-while ensuring that our counterparts walk away wanting to negotiate with us down the road. And along the way, they pose and offer surprising answers to a number of perplexing puzzles: when does too much talent undermine a team's or company's success; when can acting less competently help you gain status, why many gender differences in the workplace may simply be power differences in disguise; why ending an auction at two am can get you the best outcome; how our best intentions can ironically make us appear racist; and why husbands gain weight during pregnancy. We perform at our very best when cooperation and competition are held in the right balance. This book is a guide for better navigating our social world by learning when to cooperate as a friend and when to compete as a foe-and how to be better at both.